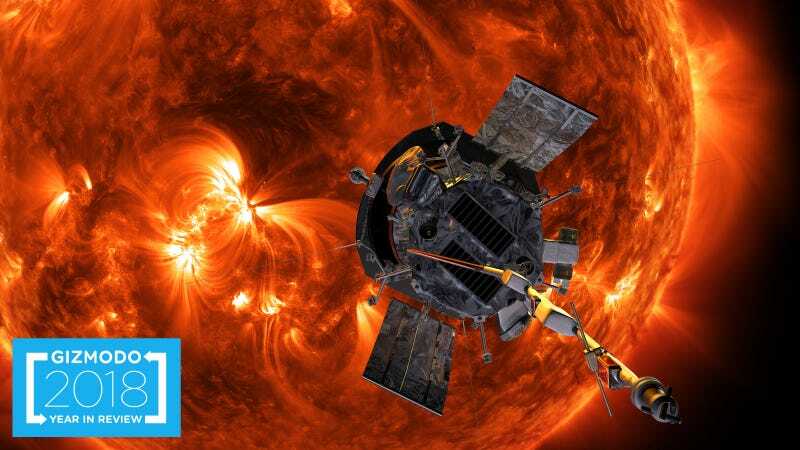 Illustration of the Parker Solar Probe near the Sun. Scientists publish incrementally—sometimes a new paper shatters our understanding of a topic, and other times it merely adds a bit to what we know. Science is the pursuit of understanding, performing more tests and building more advanced tools in order to reveal the truths inherent to our universe. It’s worth taking a step back, then, and thinking about what grander stories have emerged from all of these smaller steps and new results. We’ve compiled a list of some of the most important science stories of the past year. These events dominated headlines in 2018 and will continue to shape the world of science in the year to come. At the end of 2017, President Trump ordered NASA to send people back to the Moon rather than heading straight to Mars, but even so, Mars hogged the planetary spotlight this year. Plenty of new research emerged from landers: The European Space Agency’s Mars Express spacecraft saw signs of a standing body of liquid water beneath the ice at the Martian south pole. The Curiosity rover found 3.5-billion-year-old organic molecules and signs that the planet’s methane levels varied seasonally—a signal that the planet might be more active than we thought. And there’s tons more to be excited about. Both the upcoming NASA Mars 2020 and the ESA ExoMars missions have announced where there rovers will land. NASA’s InSight lander touched down safely just last month on a flat Martian plane to hunt for Marsquakes. It returned its crystal-clear first photo of the Martian surface just hours later. And the planet shone brightly this summer, presenting a treat for skygazers on Earth. But not all was rosy on the Martian surface. A dust storm that began in May soon became a planet-enshrouding tempest. Curiosity made it through, but the solar-powered Opportunity has remained silent ever since the thick dust sent it into hibernation mode. NASA has extended its efforts to contact the rover until this coming January at the earliest. We’re crossing our fingers. Aside from Opportunity, this year saw several beloved space missions either end or malfunction. The planet-discovering Kepler spacecraft, which launched in 2009 and has already “died” once after a 2013 malfunction, continued chugging onward, discovering new planets as a rebranded K2. It discovered almost 2,700 exoplanets in its nine years of hunting, but it finally ran out of fuel and was retired by NASA this year after putting up a fight. At around the same time, the Dawn Mission, launched in 2007 to orbit the asteroid Ceres, was retired as well. NASA flagship missions Hubble and the Chandra X-Ray telescope, too, showed signs of aging after they both experienced safe-mode-inducing glitches caused by faulty gyroscopes. Both have since been fixed—Hubble mainly needed a restart and some jiggling around. And you might remember another high-profile breakdown: The rogue Tiangong-1 satellite re-entered the atmosphere in an uncontrolled plummet. We prepared for the worst (but knew we’d be fine), and in the end, Tiangong-1 hit the Pacific Ocean far from any humans. The International Space Station faced some changes of its own. NASA’s new administrator, Jim Bridenstine, spoke to companies about privatizing it. More recently, scientists found a hole in it, and wondered where it could have came from (Russians claimed it was sabotage). The ISS might even have superbugs thriving alongside its human crew. And after a Soyuz capsule launch failed, forcing two astronauts into a heart-pounding emergency landing, we wondered how we’d get back to space. Always planning ahead, NASA has already selected crews to fly on future spacecraft built by Boeing and SpaceX. All of the recent news about malfunctioning and deteriorating space infrastructure might have you thinking that humanity has hit a low point in space research, but this past year proved quite the opposite. NASA launched its incredible Parker Solar Probe on its journey to study the Sun up close, without melting. NASA’s TESS embarked on its mission to catalogue exoplanets within 300 light-years of Earth, and has already spotted its first. The OSIRIS-REx mission, which launched last year, has begun to return pictures of its target, the asteroid Bennu. And New Horizons, which previously studied Pluto, is gearing up to fly by distant Kuiper Belt Object Ultima Thule (or as we call it, MU69) on New Year’s Day. The Japan Aerospace Exploration Agency (JAXA) and ESA have their own missions underway. The Hayabusa2 mission rendezvoused with its target, the asteroid Ryugu, snapped pretty pictures, and dropped landers onto its surface. BepiColombo launched and is now heading to my favorite planet, Mercury. And the ESA’s Gaia returned an incredible map of the stars. Meanwhile, U.S. lawmakers have discussed what’s next for NASA. The James Webb Space Telescope’s launch was further delayed to 2021, prompting NASA to perform an independent review to see what went wrong. Congress performed several hearings to discuss JWST and the future of space research more generally. But some are worried about securing funding for these large missions. And while studies have demonstrated that the much-hyped gene-editing system CRISPR might have unintended side effects, debate has continued about the ethics of editing an embryo’s genes. That’s come to a head recently, when a scientist claimed that he’d edited the genes of twin baby girls in China. That sparked outrage and scrutiny from scientists worldwide, as well as denials from several people affiliated with the scientist making the claim, who later revealed a second gene-edited pregnancy. Chinese scientists also cloned the first monkeys this year. DNA testing has left the purely scientific realm as at-home genetic tests for ancestry and disease risk have become nearly ubiquitous, despite not being 100 percent accurate and concerns about who sees all of the collected data. Police even caught a serial killer with the help of a public genetic database, leading to companies adopting new changes to how they handle your DNA data. A 15-year-old shows off their Juul. Meanwhile, the FDA has realized that teens really like vaping, which might seem better than smoking cigarettes but is still addictive and likely disease-causing. The FDA has called teen vaping an epidemic that’s “out of control.” Reports showed that popular vape manufacturer Juul knew teens were using its product but didn’t update its advertising accordingly. And if you thought vaping was bad, just wait until you read about alcohol! Scientists picked apart past claims about supposed benefits from drinking. The NIH nixed a study that would make healthy participants drink daily, while another study found that it takes less alcohol than you think to adversely impact your heart health. Another study, based on data from around the world, found that there seems to be no safe level of alcohol drinking. The WHO also found that alcohol kills 5 percent of people worldwide. A firefighter battles the Camp Fire in California. 2018 was marked by natural disasters. The Carr Fire burned this summer, becoming one of California’s worst wildfires on record and killing eight people. Not long after, the Woolsey and Camp fires ignited, the latter becoming the deadliest and most destructive wildfire in California’s history. Both fires are now contained, but have left 88 dead, combined, with 200 people still missing in the Camp Fire’s wake. Climate change, combined with decades of fire suppression in the early 20th century and an increase in people living near forests, has exacerbated wildfires and their effects. The president blamed, uh, not “raking” the forests. Another fiery event topped the headlines earlier this year: fissures opened at Hawaii’s Kilauea volcano, spreading tendrils of lava over parts of the Big Island and leading to explosions of ash. The eruption changed the Hawaiian shoreline. While volcanic eruptions may be inconveniencing or even devastating for humans who’ve moved to volcanic areas, they’re a natural part of the Earth and the reason we have Hawaiian islands in the first place. Meanwhile, hurricanes walloped the Atlantic coast. Hurricane Florence dropped historic rains on the Carolinas, leaving a path of devastation. Hurricane Michael erased towns from the Florida panhandle. And, yes, climate change is partially to blame for these increasingly intense hurricanes. A series of reports released this year have issued dire warnings about the negative effects of climate change. The Intergovernmental Panel on Climate Change found that the difference between 2 and 1.5 degrees Celsius of global warming (that’s 3.6 versus 2.7 Fahrenheit) could reduce the number of people potentially impacted by climate-related risks to a few hundred million by 2050. Both numbers would still wreak ecological havoc, though the lower one less so—but keeping to 1.5 degrees of warming will be incredibly difficult. The International Energy Agency’s World Energy Outlook report, too, warned of a bleak future, finding that emissions have once again increased and will continue to do so, as America produces more oil from fracking and China imports more oil than ever. And just over Thanksgiving weekend, the U.S. government released its widely covered National Climate Assessment, warning that climate change would have devastating impacts to the economy. Trump didn’t believe its conclusions and demonstrated yet again that he knows little about how the climate works. Donald Trump’s election in 2016 galvanized scientists, leading to the 2017 March for Science and the creation of scientifically minded interest groups such as 500 Women Scientists and 314 Action. This year, scientists have asserted themselves again: more than a thousand signed a letter condemning the separation of immigrant families at the U.S.-Mexico border. But the change has even come to Congress itself. Plenty of candidates with science backgrounds joined the House of Representatives, including several newcomers and folks who flipped their district. They ran on science-backed policies relating to health care and, of course, climate change. It’s unclear whether their elections will lead to a sea change in Congress, but it’s tangible proof of scientists applying their expertise to the political sphere. Fossil of a partial human jawbone dated to between 175,000 and 200,000 years ago. New research has rewritten some of humanity’s early history. We’ve long heard that modern humans evolved from one “mitochondrial Eve,” a single woman in Africa around 150,000 to 200,000 years ago. But things seem to be a lot more complicated. Instead, analysis of the existing literature found that humans likely evolved from several populations around Africa, separated by the continent’s various geographical boundaries. And even when humans began to migrate out of Africa was called into question, after scientists found a jawbone in Israel 50,000 years older than any found prior, dating to between 175,000 and 200,000 years ago. And then, in an even more baffling find, scientists identified what appeared to be stone tools in China, 9,000 miles east of Africa, dated to between 1.3 million and 2.1 million years old. These possibly came from our hominid ancestor Homo erectus. Together, along with 2.4-million-year-old stone tools found in Algeria, it appears that hominids spread around Africa and left the continent earlier than previously thought. Scientists even found the oldest known drawing on record—a silcrete crayon crosshatched onto a rock flake, found in a South Africa cave and dated to about 73,000 years ago. And finally, famed physicist and science communicator Stephen Hawking passed away at 76 after a storied life researching black holes and communicating science to the public. He finished papers just around the time of his death dealing with theories of the early universe, and physicists remembered him fondly. Plenty of other things happened in 2018 that don’t neatly fit into these larger stories. Scientists discovered a blazar spewing neutrinos directly at the Earth, solving a long-standing mystery. President Trump discussed implementing an independent military space force, but decided to pursue other options. Elon Musk sent a Tesla to space. 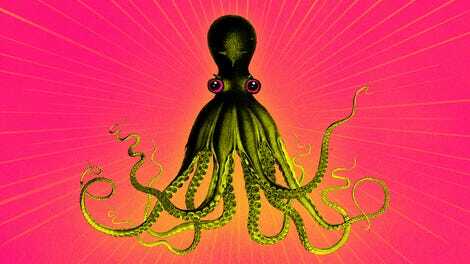 A scientist gave MDMA to octopuses. There’s much to look forward to in 2019, and we’ll have another article all about that soon. But 2018 certainly was a memorable year for science.